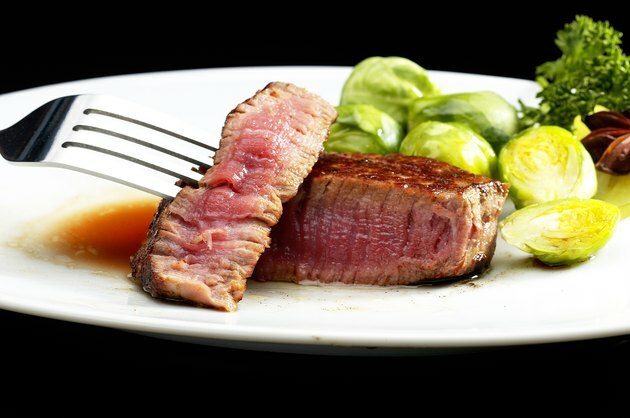 A petite filet of beef is typically between 4 and 6 oz. of steak cut from the center of the tenderloin. Many people consider it to be the most tender cut of steak, and the petite portion makes it a more waistline-friendly red meat option. To get the best out of this rather expensive cut, make sure you are seasoning and cooking the meat properly, as undercooked beef can be a health hazard and overcooked beef can be dry and tasteless. Place filet in pan to sear. According to chef Giada De Laurentiis, each side will take three to four minutes. Use your tongs to turn the steaks. Transfer skillet to oven and bake steaks to desired temperature, turning them halfway through. Check temperature with your meat thermometer. Cook to 145 degrees for medium rare and to 160 degrees for medium, according to the USDA. Remove steaks from oven. Wrap them in foil and let them rest for five minutes. This allows the beef to absorb all of its own juices before being cut.